Bluebeam Revu Software & Support in SC and NC | TPM, Inc.
Are your paper processes holding back your business? Take paperless workflows to a whole new level. Revu 2018 delivers new tools and enhancements to help you push the boundaries of PDF navigation and reporting. 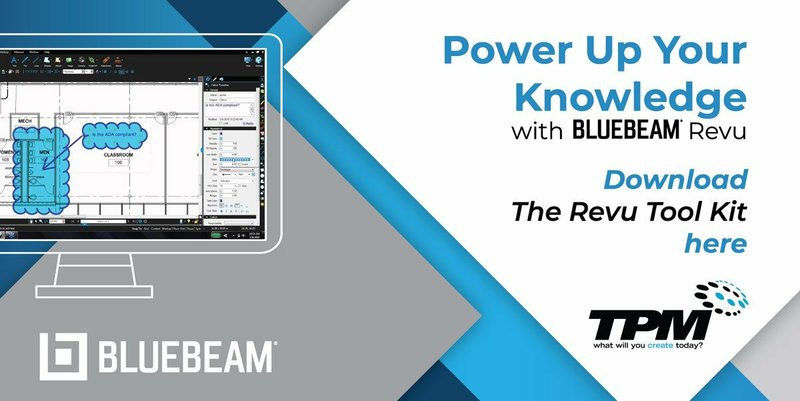 Bluebeam Revu combines powerful PDF editing, markup, and collaboration technology with reliable file creation. You can push the limits of project communication with one of Revu’s three editions: Standard, CAD, and eXtreme. Learn more about what each of these solutions can offer you and how TPM can help you adopt the right one. Design Review: Revu speeds up design reviews by allowing project partners to mark up and collaborate on the same documents in real time, or any time. Quantity Takeoffs: Revu’s measurement tools help you capture a project’s true scope and create a stronger bid—which gives you the competitive edge. Submittal Review: Revu simplifies submittals with powerful markup and editing tools, and integrates seamlessly into many document management systems to keep your project running smoothly. RFI Posting: Revu keeps RFIs clear and organized with smart markup, hyperlinking and visualization tools, helping your project stay on track. Punch Process: By sorting and summarizing punch items within drawings, Revu helps project teams achieve a 90% completion rate on first back check. Project Handover: With Revu’s dynamic document creation tools, you can deliver smart O&Ms that give facilities managers quick and easy digital access to critical project information. The PDF solution for Windows desktop and tablet users who want to create, edit and mark up PDF files. Includes Bluebeam Studio™ for real-time document-based collaboration. The enhanced PDF solution for CAD users working on a Windows desktop or tablet that includes direct plugins for AutoCAD®, Revit®, Navisworks® Manage, Navisworks® Simulate, SOLIDWORKS® and SketchUp® Pro. Convert any IFC or U3D file to PDF with ease. Revu CAD also has direct integration with SharePoint™ and ProjectWise™, and includes Bluebeam Studio™ for real-time document-based collaboration. The ultimate edition of Revu includes all of the same PDF creation, markup, editing, and collaboration capabilities found in Revu CAD, as well as OCR+, PDF form creation, Scripting, Structures™, Batch Link®, Batch Slip Sheet and Redaction. Don’t over spend on expensive Adobe products when you can get everything you need and more with Bluebeam Revu products. From basic PDF creation, editing, and markup, to PDF form creation and scripting structures, we have you covered. Not sure which Revu solution is best for your needs? We will not only help you to find the right product, we will also provide support and training. Give us a call or contact us online to get your PDF navigation and reporting software.